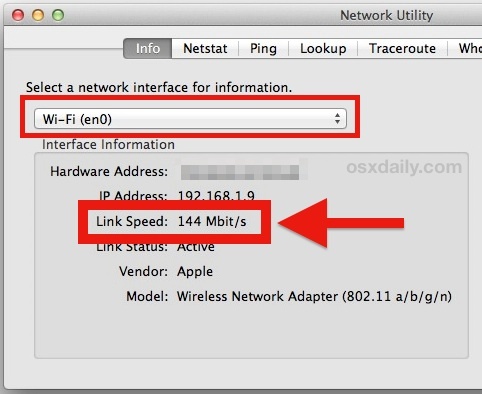 If you need to find out just how fast your wi-fi link speed is, or rather, the speed of which your Mac is connected to a particular wireless router, you can find this data through the Network Utility app that is bundled in every version of Mac OS X. This is really the fastest way to determine the link speed of any interface, whether Wi-Fi, ethernet, or otherwise, despite the always handy Network Utility app having been relocated to the depths of a system folder. If you plan on getting a lot of use out of this, you may want to move Network Utility for easy access and usage, or just get used to launching it through Spotlight, which we’ll show below. There are plenty of reasons this tool is useful to have around and the link speed is good to know, whether it’s troubleshooting sluggish wifi connections, optimizing a network, or figuring out if one channel is better than another for your network to use. Elsewhere at the same Network Utility panel you’ll find details of the interfaces vendor and model, which will show you what protocols are supported by the wi-fi card, whether it’s 802.11a, b, g, n, or all of the above. 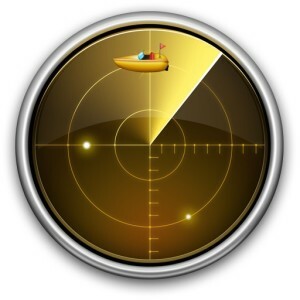 Notably missing is that encryption is not listed within the network details, but you can find encryption type details elsewhere in OS X rather easily from just about anywhere. It’s important to note this number is the connection link speed, typically signifying the maximum throughput of a particular network interface, and not necessarily the speeds of which you are getting from the internet or network. Accordingly, this is not intended as a method to test the internet connection speed of a computer to the internet in general, and there are more precise ways to do that, like this one using the command line, or by using an app or service like SpeedTest, which is free. I think if you hold option and click the Airport Menu item it shows that info as well. Not on a wireless client to check, but I think so. Sort of. If you Option+click Airport it shows “Transmit Rate”, which doesn’t show the same number as Network Utility, maybe one is in megabytes and the other is megabits? Anyone know that? Anyway, I think this is an even more useful trick with good old fashioned wired networks with Ethernet, since it lets you know if your particular Mac NIC card is a 10/100, 10/100/1000, gigabit, whatever. The Transmit Rate shown in the pulldown is the maximum speed achieved between the Mac and router in megabits, the Link Speed in Network Utility is the maximum speed possible for the interface. Basically, you want those two numbers to be as close to each other as possible. When you hold the Alt(option) key while clicking the WiFi icon in the menubar you get more information already, and you can choose Wireless Diagnostics there also. Is this the speed of my wireless router? Or is it the speed of the cable service to my wireless router? I’m trying to decide how to upgrade my speed throughput. The number shown is the maximum link connection speed between the Mac and the wireless router.